(SAM) Ah Roma! The Eternal City. My favorite place in all of Europe. 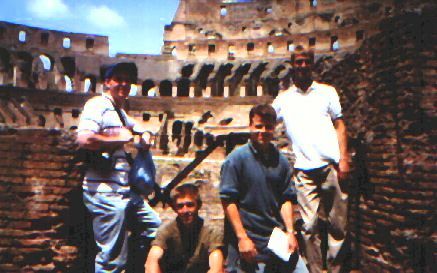 Before I chronicle our first of the three and 1/2 days in Rome, I would like to say that all three of my companions were a pleasure to travel with. 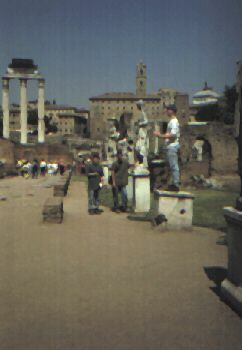 The mission which they chose to accept was to see a good portion of Rome in 3 1/2 days. This, of course, is impossible. I pushed them hard; only pizza to eat, no sleep, Roman traffic, pigeons, basilicas, long walks, popes, Roman stuff, and crazy young girls on mopeds. They all persevered and were even enthusiastic up until the very end. Super! We awoke about 7:30 and began the 8 km trek to Roma from our campsite about 8:30. We bought food at a store along the way and parked between the Circo Massimo and the Roman Forum. We walked up the Palatine (one of the seven famous hills of Rome) and looked for a way to actually enter. There was a fence around it and, unlike the Christendom in Rome trip, we had to pay 12,000 1. to enter. 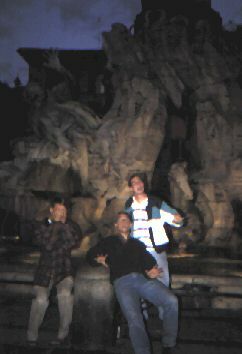 Matt uttered those four words that are music to my ears while in Rome, "Hey, we will only be here once, so let's do it!" Well, for lack of a better term, Matt was impressed with the Colosseum. Jon and I tried to work a semi-loose brick from a wall but it was too tight. Chris paid 6,000 1. to go up to the higher levels of the Colosseum. I told him that if he sat in the place of the Emperors, I would take his picture. So he did and a man with a whistle and an official-looking uniform started going crazy. 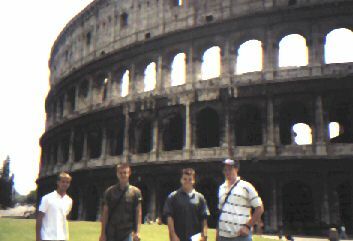 I took the picture and we escaped the Colosseum with only minor casualties. 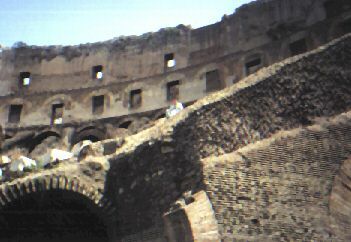 (MATT) Shortly after, we ate in sight of the Coloseum (a mix between a piece of bread and a doughnut that Jon picked out), had a liter of Fanta and took off for St. John Laterine. (SAM) St. John Laterine is one of my personal favorites. It is one of the four main basilicas of Rome and only the Pope can say Mass at the main altar. Down the main naive were huge marble statues of the Apostles. In the canopy over the main altar were relics of the heads of both St. Peter and St. Paul. The giant bronze doors were over 2,000 years old. St. John Laterine is the numero uno church in all of Christendom. Outside the basilica, we stopped at the place where St. Francis and some brothers, all in bronze, first saw St. John Laterine. 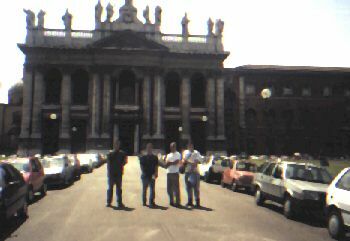 They were traveling to Rome to receive approval for their new mendicant order. After a photo shoot with Italians gawking at us, we ventured a short walk to Santa Croce in Jerusalem. 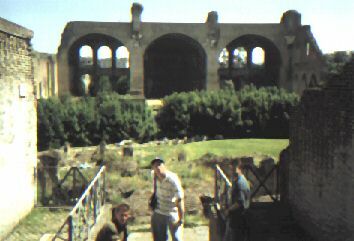 Chris said this was his favorite place in Rome simply because of what it contained. We entered the church and went forward and to the left where a door led into a hall. There we saw a 4 1/2 foot plank which was a piece of the cross of the good thief crucified beside Christ, St. Dismas. Then we walked down the hall to the small chapel which contains the relics of the True Cross and related objects. There was no one in the chapel but us and we walked behind the altar to the glass that contained the precious relics. We saw: the three largest pieces of the True Cross, nail, two thorns, a bone from the finger of St. Thomas, and part of the sign that hung over Christ's head. We spent some time looking at the relics and then said a chaplet of divine mercy. Our next stop was the Holy Steps. We had to back track because I had a temporary brain lapse, but the walk was very short. These steps are the ones that Christ walked up to meet Pontius Pilate. 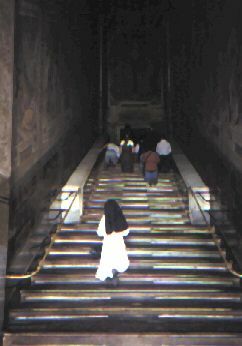 They were brought to Rome from the Holy Land by St. Helen. The steps are now covered with wood because so many pilgrims go up them on their knees. The marble was becoming so worn that the wood was necessary, but there are still many places where one can see and touch the marble. We started our assent all the while looking at a beautiful crucifixion scene at the top. Magnificent and very moving. It is called "the most holy place in all the world." 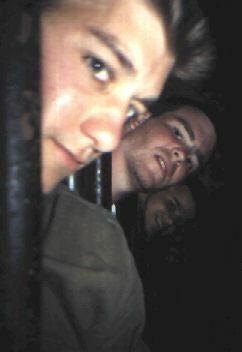 Matt, overflowing with the gift of the Holy Spirit, was moved to spy two young girls. He started talking to them and then uttered those magical words, "Hey, you are only going to be here once; you might as well do it." Thus they began their assent. When they were about half way up, one started to look like she was in major pain. Matt's spiritual victory began to change to a mortal fear as he wondered how many ways she was planning to torture Matt to death. Plus we were in a hurry, so we didn't wait to congratulate the two girls when they reached the top. Our next stop was Mary Majors, also one of the four main basilicas of Rome. It is the largest church dedicated to Mary in Rome, and the most prestigious in the world. Very beautiful and very large, almost too large to grasp. As we waited to hear Mass, Matt, Jon, and I said the rosary with the Italians in Italian (how strange). We talked to the priest after Mass and he told us that while we were in Italy, we should remember something, "If God had wanted us to drink water, he would not have changed it to wine." We admired the grand structure for a time and then took a rest outside on the steps. I knew that St. Lucy's Convent was close by and that we could get relics there. But we could not find it so we moved on to St. Peter in Chains. Here we saw Michaelangelo's Moses and also the chains the Romans used to bind Peter and Paul. P.S. Remember, reader, that this is still our first day in the Eternal City. The average pilgrim would have fainted from exhaustion long ago, but not the Tumbleweeds. We walked back to the car and ate the small amount of food we had left. Now we were ready for the night life. I looked on the great map that Denise gave us and picked the Piazza Navona. Matt drove us there and we found free parking. (Later we had to pay.) We strolled, looked at the people, painters, and fountains. We walked a little way from the Piazza to get more Gelato for less. It was the perfect end to a great day. Four grande gelatos with three flavors for only 3,500 l. We ate these gargantuan treats in the piazza and chilled for a while. Finally, we drove to our campsite at Seven Hills and crashed. Tomorrow would be another big day.